Everything you need to know about Padre Island Rentals information & policies. Questions and answers related to renting vacation homes and visiting South Padre Island with a focus on making your rental experience easy and your entire vacation a fun and pleasant adventure. Your reservation with Padre Island Rentals is for a particular home or condominium. Please review the arrival and departure dates and information about the property carefully. We rent accommodations on a nightly, weekly, and 30 night basis. During the Summer Season and certain holiday seasons, a three-night minimum stay, and in some cases, a seven-night minimum stay is required. For most rentals, an advance rental payment of 25% of the total rent, plus a nonrefundable rental fee will be required to hold the requested reservation. We will be happy to process your advance payment once we have received your signed rental contract. Rental contract and payment may also be performed online. We accept MasterCard, Visa, American Express, Discover, or PayPal. Personal checks cannot be accepted if your arrival date is within 30 days of the date that you reserved your property. If you are making your South Padre Island vacation rental reservation within 30 days of arrival full payment will be due. For rentals of 30 nights or more, an advance payment of $300.00 is required and is not refundable at any time. Final Payment for monthly stays is due 30 days prior to arrival. For student spring break rentals, full payment is required and is not refundable for any reason. Payment of the remaining 75% is due 30 days prior to arrival. For family and monthly reservations, the Refundable Security/Damage deposit is processed the day prior to your arrival by means of an authorization to charge the card on file. This authorization is only turned into a charge in the event of damages. If your payment was by check or money order, you have the option of leaving a cash deposit upon arrival or a credit card imprint to cover the security deposit. Refundable security deposits for spring break are due 30 days prior to arrival and are charged to the credit card on file and refunded after departure. Personal checks can only be accepted if the entire amount is prepaid at least 30 business days prior to the arrival date. For Regular Vacation Rental Stays – The Rental Agent requires a 45-day Notice of Cancellation for the Guest to receive a refund of rental payments. The Guest refund will be less a $150.00 administrative fee. For Stays of More Than 30 Days – The holding fees for stays of more than 30 days are non-refundable. For Spring Break Reservations – Spring Break reservations are non-refundable. Changes in a reservation such as shortening a stay or transferring to another property are considered a cancellation. The Rental Agent strictly adheres to this Cancellation Policy. Please notify us immediately of cancellation. If cancellation is necessary and you purchased trip insurance through Red Sky Insurance you can Click Here to complete their easy-to-use claim forms. You can also call them at 866-889-7409. Their office hours are from Monday to Friday from 8:30 am to 5:00 pm EST. … because anything can happen. Every year, sickness, injuries, inclement weather, and other emergencies cause our guests to delay, interrupt, or even cancel their vacation. For that reason Padre Island Rentals offers travel Insurance through Red Sky Travel Insurance. The Sun Trip Preserver offered through Red Sky Insurance reimburses guest’s vacation investment when their vacation is interrupted or cancelled due to covered unforeseen events like sickness, accidental injury, jury duty, natural disaster, traffic accident, military leave revocation, job loss, road closure, mandatory evacuation due to a hurricane and more. Just look for the Travel Insurance checkbox when booking your vacation rental online. Then, rest easy knowing your vacation is secure. Note: Travel insurance can be purchased up to 30 days prior to arrival or final payment, whichever comes first. Pre-existing medical condition waiver is available if purchased within 21 days of your initial deposit. Office hours for Red Sky are Monday through Friday from 8:30 am to 5:00 pm Eastern Time, except holidays. All reservations require a reservation fee of $15.00 to $35.00. This fee is non-refundable and must be paid with advance rental payment. 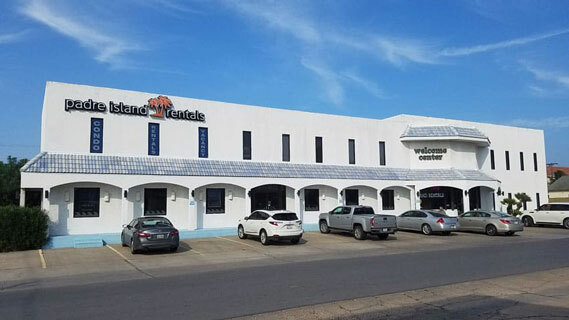 The Padre Island Rentals office is located on the corner of Kingfish and Padre Blvd. 1 ¾ miles north of the bridge on the right hand side of the road at 3100 Padre Blvd., one block north of the IGA (Blue Marlin) Supermarket. Our Front Desk is open 24 hours a day to serve your needs. Check-in here for all properties. Check-in time is after 4 p.m. on the day of your arrival at the Padre Island Rentals office 3100 Padre Blvd.. We ask that you plan accordingly with regards to purchasing groceries. Occasional check-in delays may occur during times of heavy departure and our staff will assist you during these times to make you as comfortable as possible. We have not included the cost of daily maid service in our rental rates. The majority of our customers have expressed to us that they do not want to be disturbed during their stay and do not want to pay for a service that they do not want or need. Your property will be cleaned and provided with fresh linens before your arrival, and again after you leave. When you leave, please make sure all trash is in the dumpster, place dishes in the dishwasher, and lock all doors and windows, and return the keys to Padre Island Rentals 24 hour front desk. Addtitional housekeeping is available for a fee on per cleaning basis. All of our properties are owned by individuals as a second or vacation home. Owners may have their personal items locked in a closet for their convenience. THESE AREAS ARE ABSOLUTELY NOT INCLUDED AS PART OF THE RENTAL. Checkout time is prior to 11 a.m. at the Padre Island Rentals office located at 3100 Padre Blvd.. There will be a fee charged for late departures. There are no refunds for early departures. Even if you don’t want to leave (and we suspect you’ll be sorry to go), we’ll need every minute to get the property ready for the next guest. We will gladly give you a maximum of four keys per accommodation. All keys must be returned to our rental office. There will be a $30.00 charge for each set of keys not returned by checkout time of your departure date. Parking at most properties is limited. Some of the properties have space for two cars, but in most cases you may be asked to park the second car (or any additional cars) out side of the properties parking area. Most properties do not offer RV, trailer, or boat parking. Please check the property information page on our website or call us about the parking situation at specific properties. We have tried to describe the property and its furnishings as accurately as possible. However, sometimes an owner will remodel or redecorate a property after the information has been printed. We also make every effort to keep each property and its equipment in good working order, and to make repairs as soon as possible when we are notified of a problem. No refund, or rate adjustment will be made for mechanical failures, such as air conditioning, television or appliances. You will need to bring your own beach towels, soap, & paper products, food, & condiments. If you plan to do any specialty cooking such as baking you will need to bring your own bake ware, casserole dishes, food processor, etc. We have not included the cost of daily maid service in our rental rates. The majority of our customers have expressed to us that they do not want to be disturbed during their stay and do not want to pay for a service that they do not want or need. Your property will be cleaned and provided with fresh linens before your arrival, and again after you leave. When you leave, please make sure all trash is in the dumpster, place dishes in the dishwasher, and lock all doors and windows, and return the keys to Padre Island Rentals 24 hour front disk. Additional housekeeping is available for a fee on per cleaning basis. The maximum occupancy for each property is specified on the rental contract. Any exceptions must be in writing from Padre Island Rentals Management. The properties that we rent and it’s facilities are for the use of registered guests only and cannot be used for parties, dinners, family re-unions or other gatherings that would cause the occupancy limits to be exceeded. A refundable Security/Damage deposit is due upon arrival in the form of cash or credit card. If you choose to leave a cash deposit, the deposit can be refunded upon departure between the hours of 9AM and 5PM after your rental property has been inspected. Please allow us about 1 hour to perform the inspection. If you are unable to wait, or if you checkout before 9 am or after 5 PM, our accounting office will mail you the refund check with-in 10 days. If you choose to guarantee the Security/Damage deposit by credit card, a credit card voucher will be imprinted for the amount of the deposit. This voucher is then held in our accounting office and ONLY submitted for payment in the event that any damage or cleaning charges are incurred. Vouchers not submitted for charge are shredded on a weekly basis. Our customers are covered for up to $300.00 in the event of accidental damages. We have learned that our vacationers do not travel hundreds of miles to damage a home. At the same time, experience also tells us accidents can and will happen. Rather than leaving a Damage Deposit Guests may pay an Accidental Damage Waiver (ADW). The ADW will vary depending on the size of the property, from $15 to $125. Under Padre Island Rental’s ADW you will not be required to pay for accidental damage to the home or the personal property of the Owner contained within the Premises, up to a limit of $300.00 per reservation. Occasionally a property which has been reserved will not be available because of damage to the property, because the property has been sold, or for other reasons beyond our control. When that happens, we will substitute comparable accommodations and notify you by phone or email of the change. If comparable accommodations are not available, you will have the option of selecting from available properties at the published rate or receiving a complete refund of your reservation advance payment. When you take a stroll around South Padre Island you’ll notice that we’re still growing as a community. Many new properties are under construction. There may be some noise if your property is close to a construction site. All construction crews at South Padre Island are well mannered, and work doesn’t begin before 7 a.m. during the week, 9 a.m. on Saturday and almost never on Sunday. If you have problems, please let us know and we’ll ask the contractors to be more considerate. Unfortunately, we cannot offer refunds or moves in the event of construction noise. South Padre Island vacation rental properties include housekeeping prior to arrival. Additional housekeeping, towel delivery, or rental equipment such as baby cribs, and high chairs are all available for a fee. Please contact us or view our website for more information. Not all properties are equipped with telephones and local phone service. If local phone service is important to you, please check the Amenities tab of the specific property you are considering renting to see if Local Phone Service is listed. Outgoing long-distance telephone calls are usually blocked. Some properties may offer free unlimited long distance. Again, please refer Amenities tab of the individual property you are considering renting. Please call our rental office if you have questions. Not all properties offer Internet access. Please carefully check the Amenities of the unit you are renting. If WiFi is available you will see Wifi in Unit listed. Also some condominium complexes offer Wifi in common areas. Again, check the Amenities tab in the unit you are considering renting to verify Internet access is available. Mail may be sent to a guest c/o Padre Island Rentals, 3100 Padre Blvd. 78597. Please put the name of the person receiving the mail clearly on the front of the mail. If you need to bring a pet along, we can assist you in finding a kennel. No pets are allowed in any of our rentals. Should we discover a pet in the accommodations, you will be charged a fee for pest control, a deep clean, and an additional day’s rent which, when combined, usually amounts to $500. In addition, you will need to board your pet at a local kennel or leave the accommodations. Although we cannot be held responsible for items left behind, we do make every effort to locate and return forgotten items to you. Contact our rental office and found items will be sent UPS C.O.D., or we may place shipping charges on a major credit card. There is an additional $25 handling fee. ALL of our properties are designated as non-smoking accommodations. No smoking is permitted anywhere inside of the properties. Should anyone in your group smoke, please have them do so outside on the patio, porch or balcony. Again, there is an additional fee of $500 for cleaning and damages for those guests found to have smoked in any of our properties. If you choose to accept The Sun Trip Preserver and a Mandatory Evacuation order is issued for The Township of South Padre Island during your stay, you should submit an insurance claim for the nights that you were unable to occupy the property. Rates (until advance payment has been received) and policies are subject to change without notice. Rates are subject the applicable lodging tax in effect during your stay.